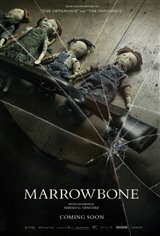 In order to escape her sadistic, serial killer husband's abuse, Rose Marrowbone moves her four children from Britain to her family estate, also called Marrowbone, in the States. When she dies not long after, her eldest son, Jack (George MacKay), and his three younger siblings, Billy (Charlie Heaton), Jane (Mia Goth) and Sam (Matthew Stagg), keep her death a secret in order to remain together, at least until Jack reaches the age of 21 and can be their legal guardian. With only a neighbor girl Allie (Anya Taylor-Joy) as their friend, the youngsters try to maintain a low profile at their rural home. However, the siblings soon find that the house is haunted by a sinister presence.